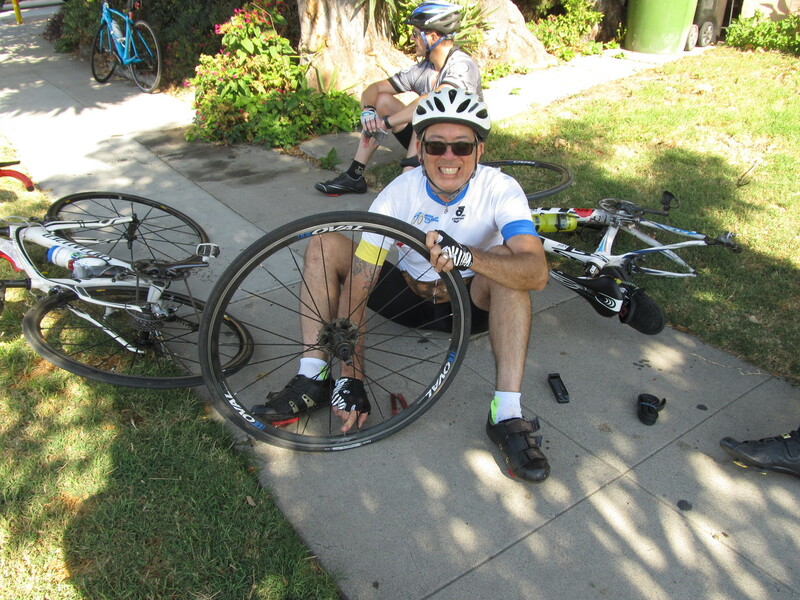 Today is my last Sunday bike club ride before at least a couple of weeks for forced rest to recover from surgery that is scheduled for this Wednesday. 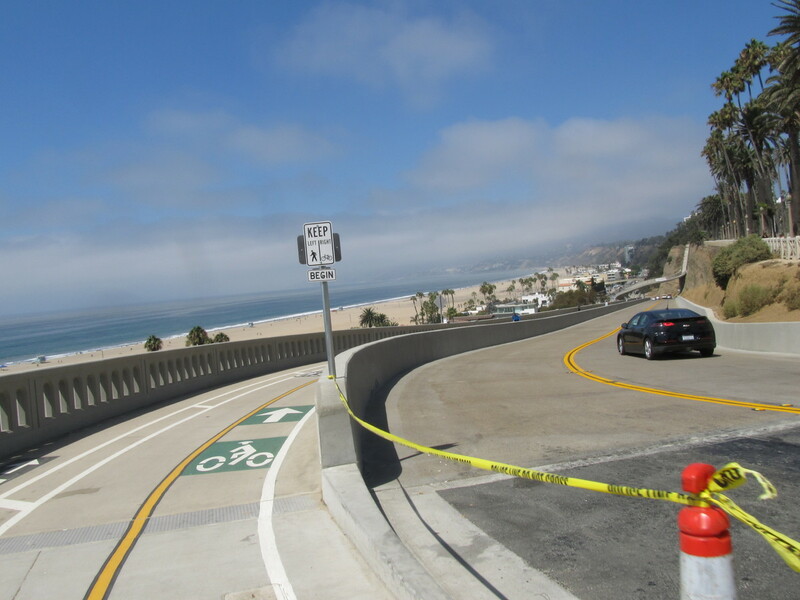 So for my last ride, I thought we should go and see the newly-rebuilt California Incline in Santa Monica. It was closed for rebuilding in 2015, and recently reopened. 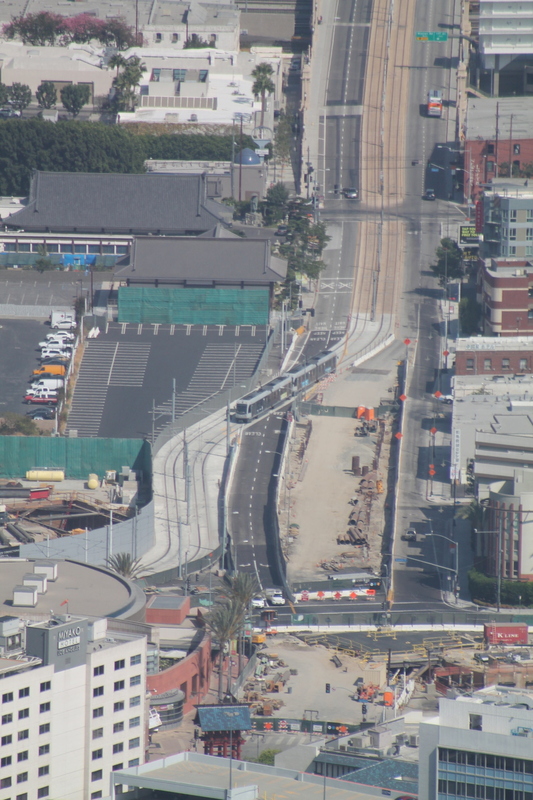 As we did the last time, we ride through downtown Los Angeles, and then west along the bike lanes and trail constructed alongside the Metro Expo Line. 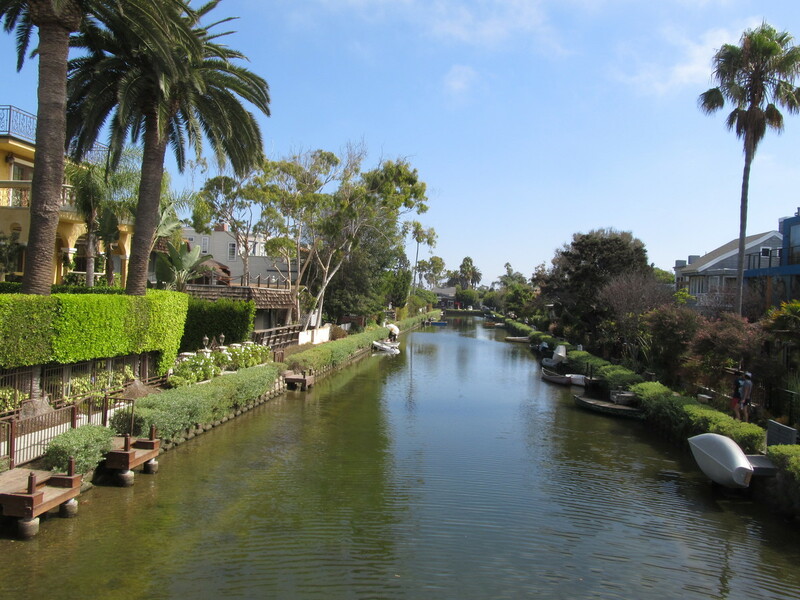 When we got to Culver City, we turned off onto the Ballona Creek bike path, and rode that to Marina Del Rey, and then north through Venice. It was a perfect day for riding. When we got to Santa Monica, we stopped for snacks at Dogtown Coffee. 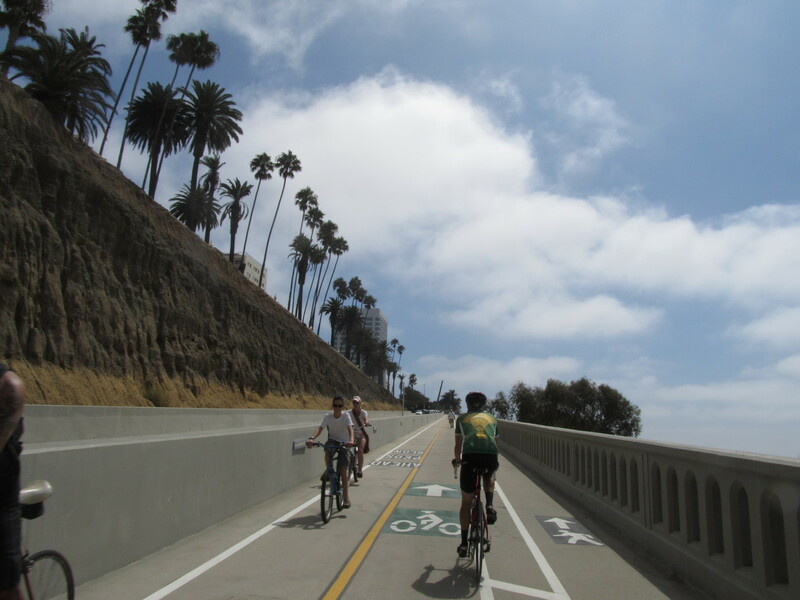 Then we rode through downtown Santa Monica to the Incline, and then down to the beach. 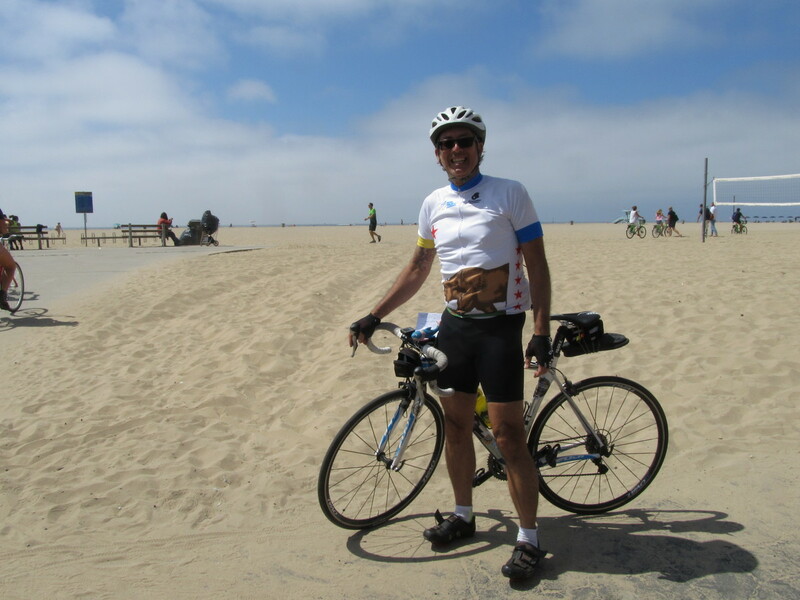 We ride all over L.A., but it’s not that often we make it all the way to the beach, so this was a nice treat. 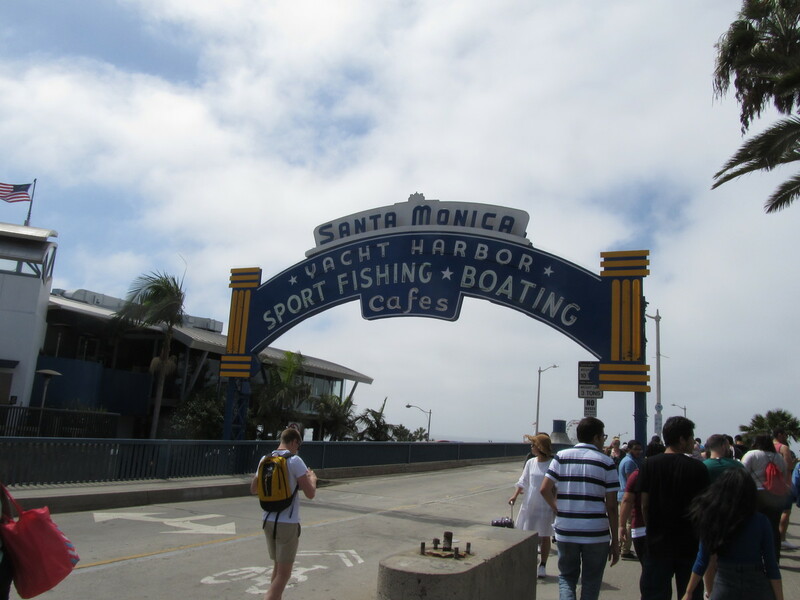 After that, we rode back up the Incline and down to the Santa Monica Pier. 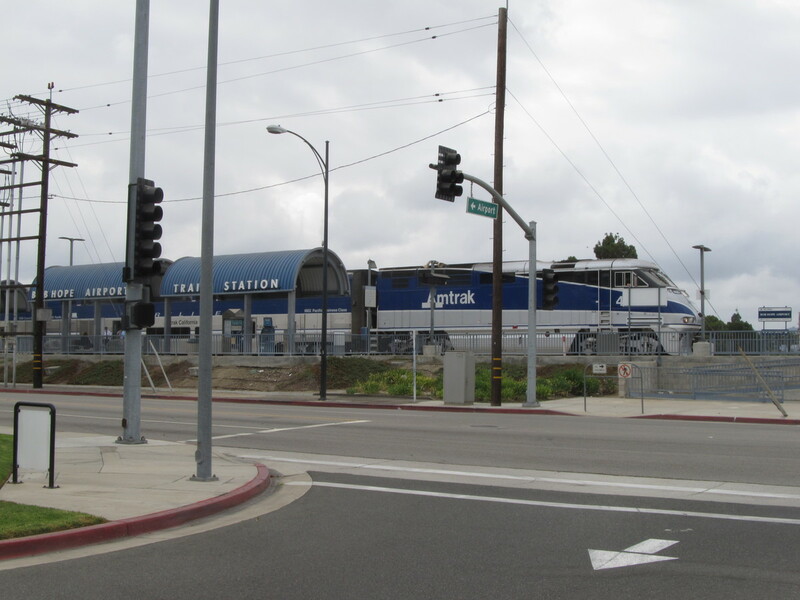 Then we got on the Metro Expo Line for the trip home. 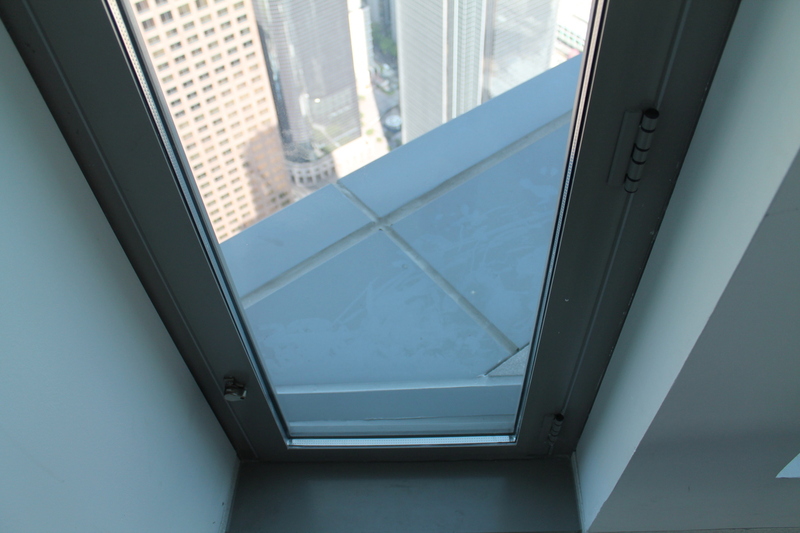 Today’s a holiday, so we went downtown to see the new OUE SkySpace on the 69th and 70th floors of the U.S. Bank building. I’ve climbed the stairs in this building many, many times, but it felt weird to be going there for any other reason. We’d made reservations online, so when we got there, we were able to go right on up. They have three floors dedicated to this, which seemed a bit odd. The entire 54th floor was just sort of a waiting area with photos and artwork to look at while waiting for the elevators up to 70. 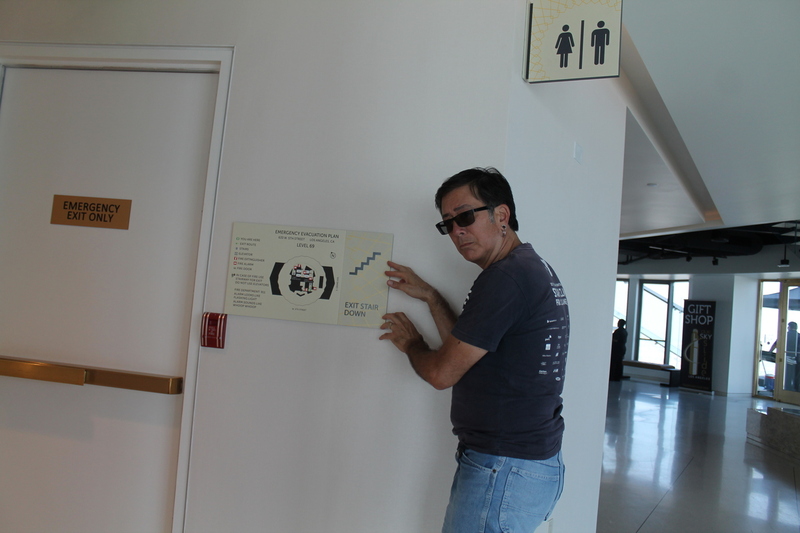 But fortunately, it wasn’t crowded, so we were able to go right on up. When we got to 70, we walked around, looking at the view in all directions. That was kind of nice, since when we get to the top of the building at the stair climb, we’re only able to look north and west. 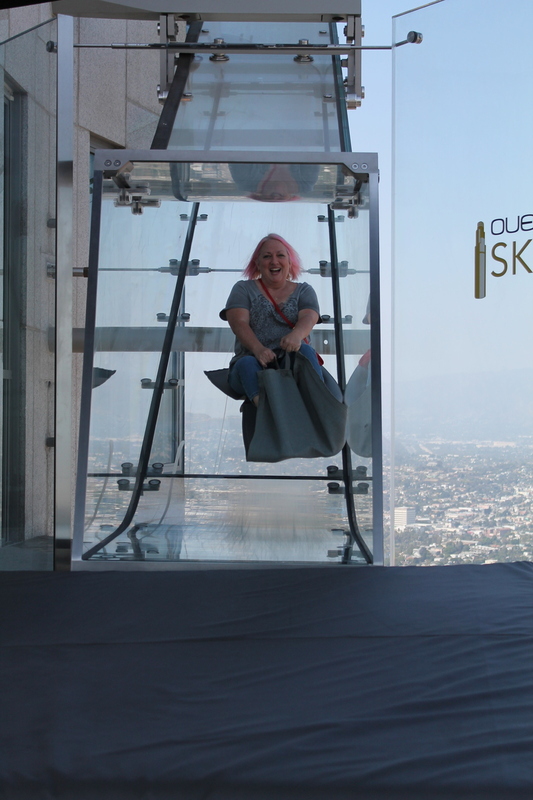 Then I walked down to 69 to see Kathleen go down the SkySlide. I did take a moment to paw forlornly at the door to the staircase. 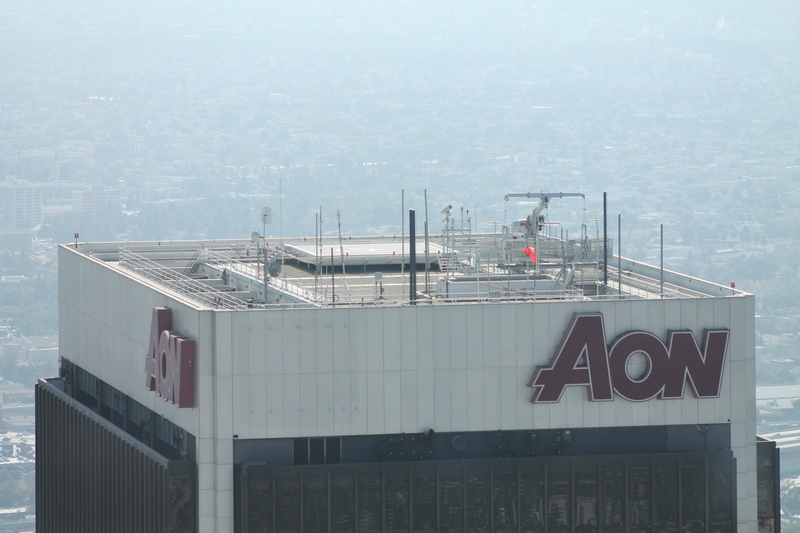 It was fun having the outdoor observation decks on the east and west sides of the building. 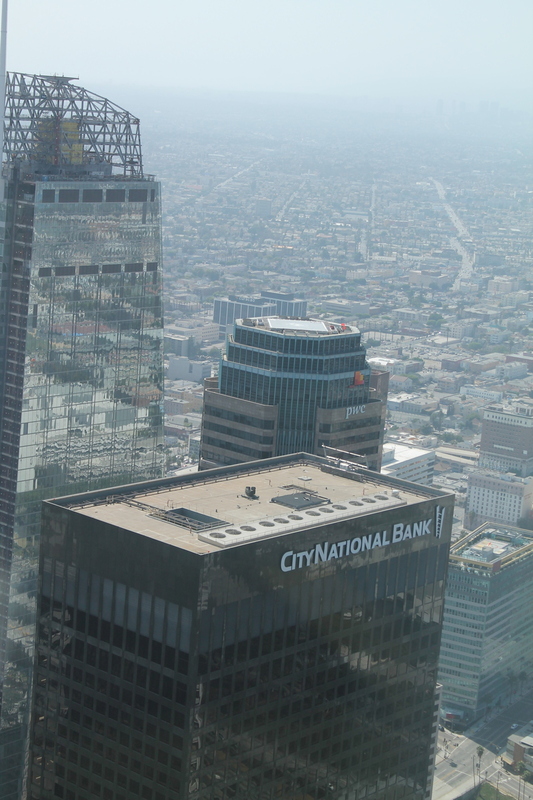 And it was novel to be able to look down on all the other tall buildings that I’ve climbed in the past. So I guess this is probably the most fun I’ve had in a tall building that didn’t involve climbing stairs. 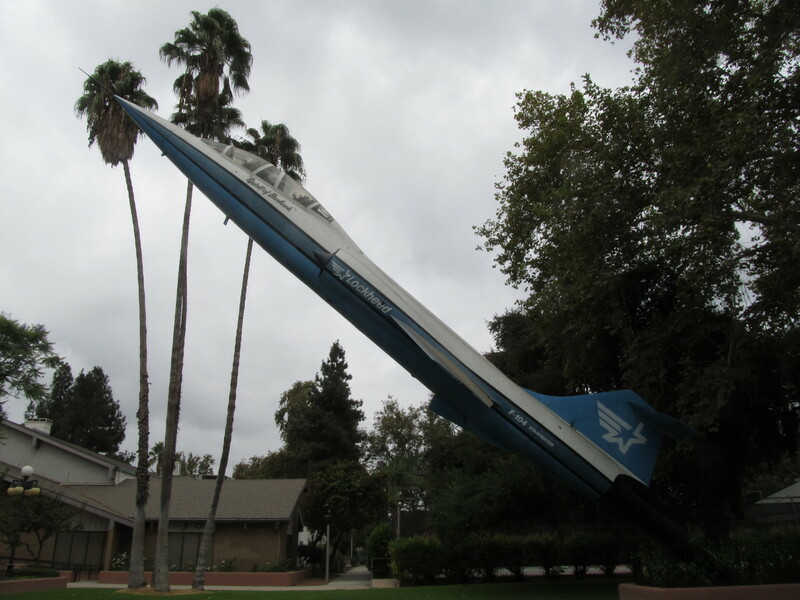 Today’s bike club ride was the route out to Burbank to see the F-104 Starfighter-on-a-stick that they have displayed in a park. 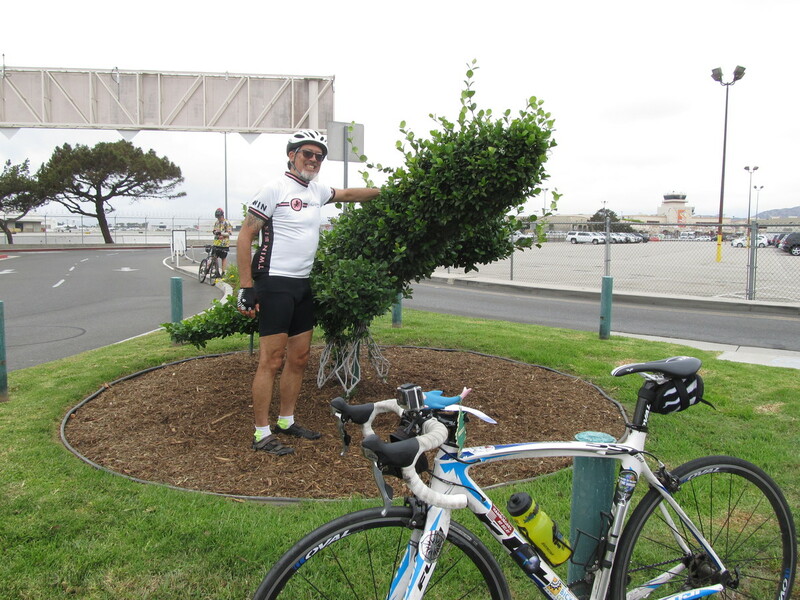 And also, we went by Burbank Airport to see how their new airplane topiary is coming along. It was cool and overcast and perfect for riding. 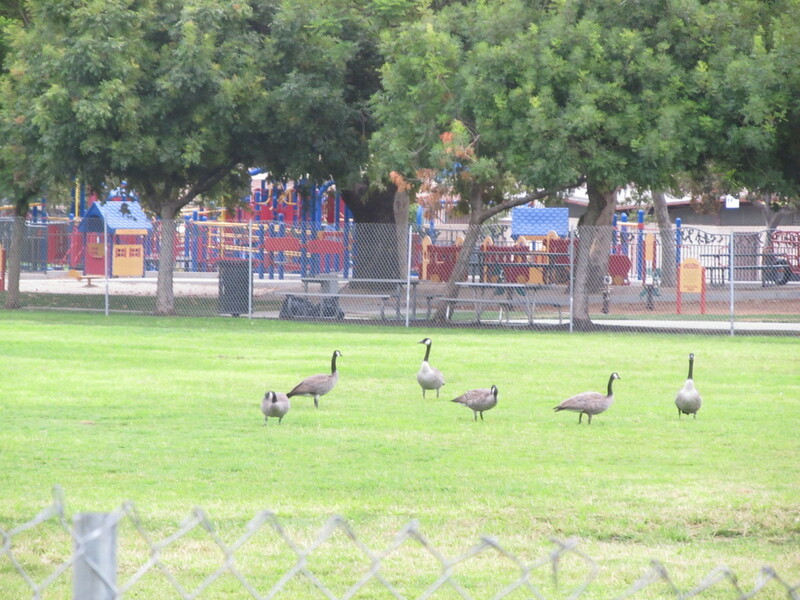 When I got to the park to meet up with the group, I saw that they had one of the playing fields fenced off, and there was a small group of geese foraging in there. 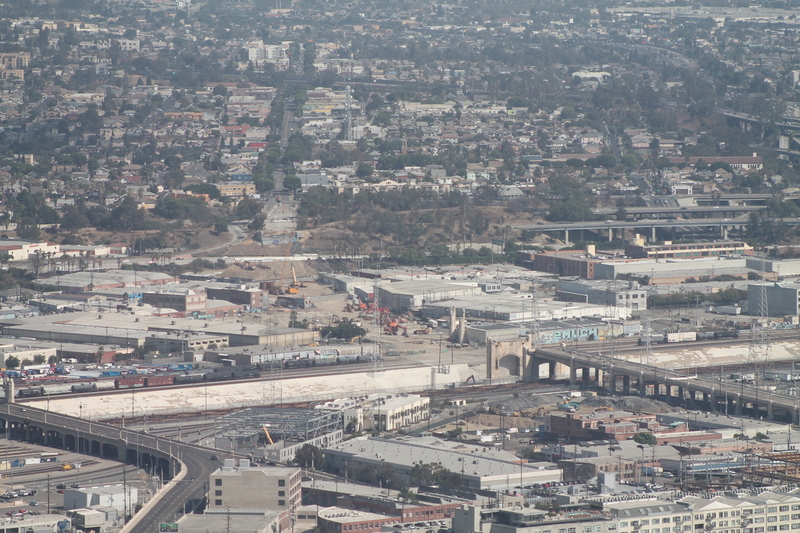 When everyone got there, we headed out straight west across Eagle Rock and Glendale to Burbank. 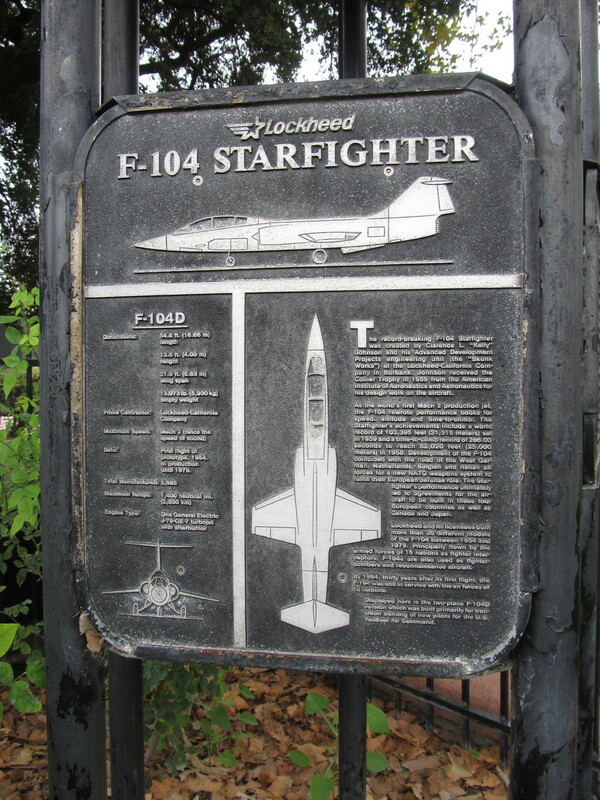 At the park, I read the little plaque that told the story of the F-104. It said it was developed by the Lockheed Skunk Works in the late 1950s, and it was in production until 1979. It also said that it set an altitude record by flying up to 103,395 feet, and a climbing record of 82,020 feet in 286 seconds. To put that in perspective, that works out to be about 195mph straight up. From there, we headed north to the airport. The new topiary is coming along nicely. We’d been to see the old one before, but the last time we were out there, the former bush had died and they’d replaced it with a new one that wasn’t quite full yet. 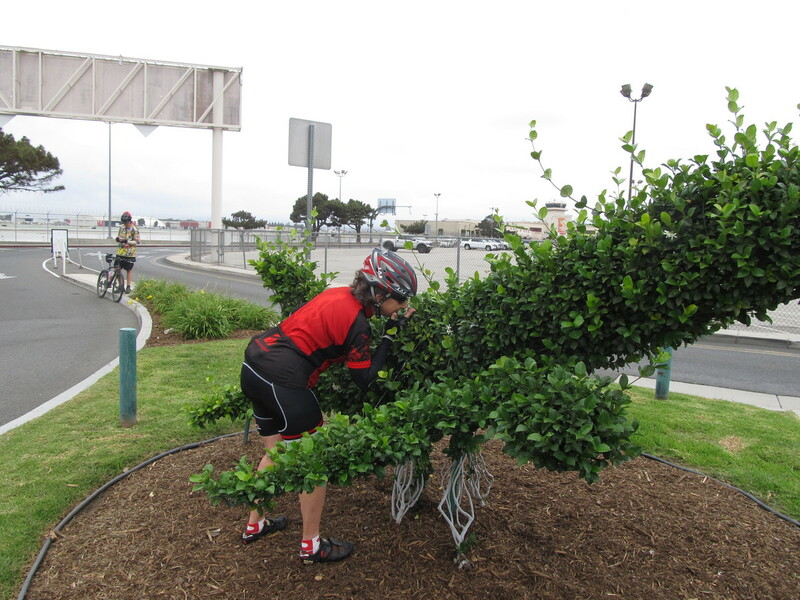 This time, the wire frame was completely filled out, and the bush needed a little trim. Carla noticed that the topiary plant itself is jasmine this time, and it was flowering. So we had to stop and smell the flowers. 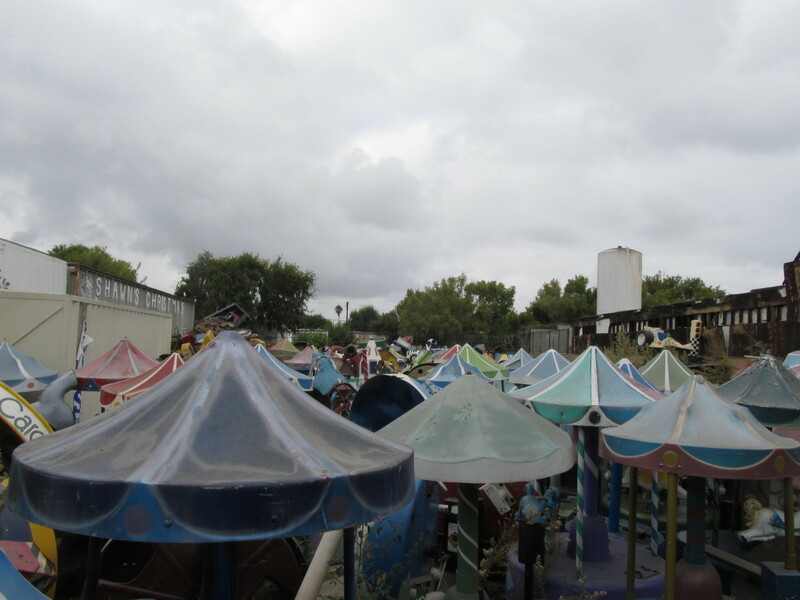 We passed the kiddie ride boneyard again. 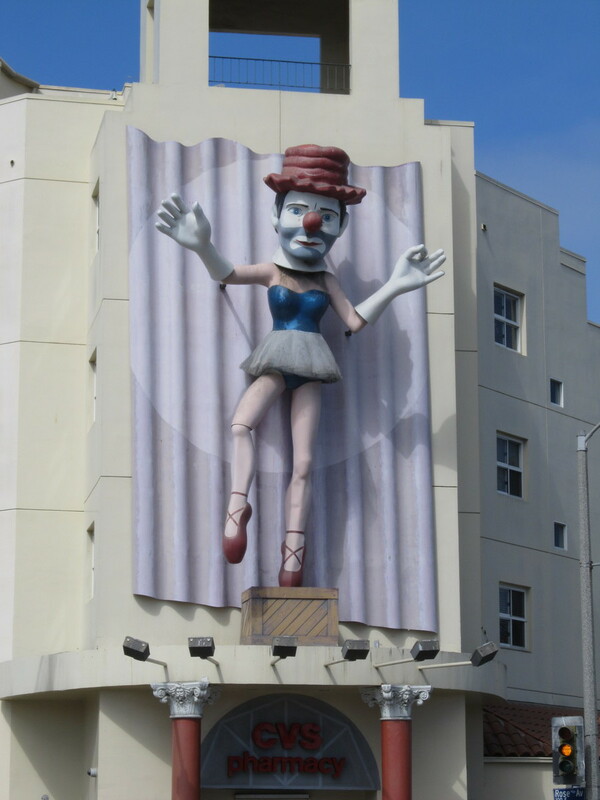 I still think that would be a perfect setting for a killer-clown horror movie. Then we stopped at Priscilla’s for snacks. 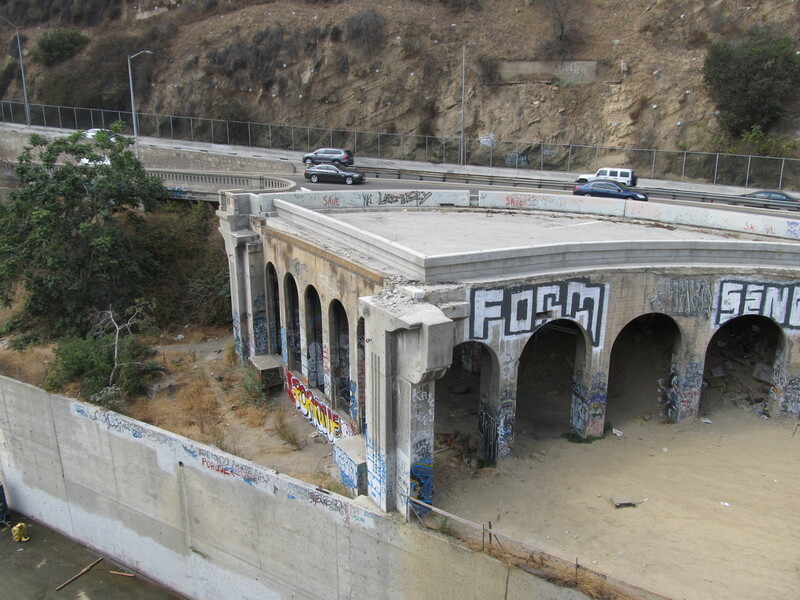 For the trip back, we took the L.A. River bike path. 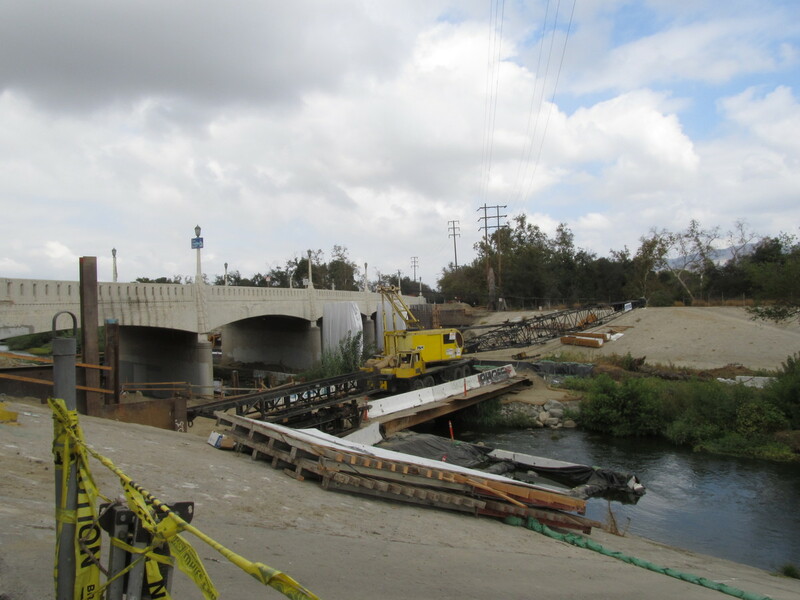 They are apparently widening the bridge where Riverside crosses over the river. It’s kind of a mess now, but it will be nice when it’s done. 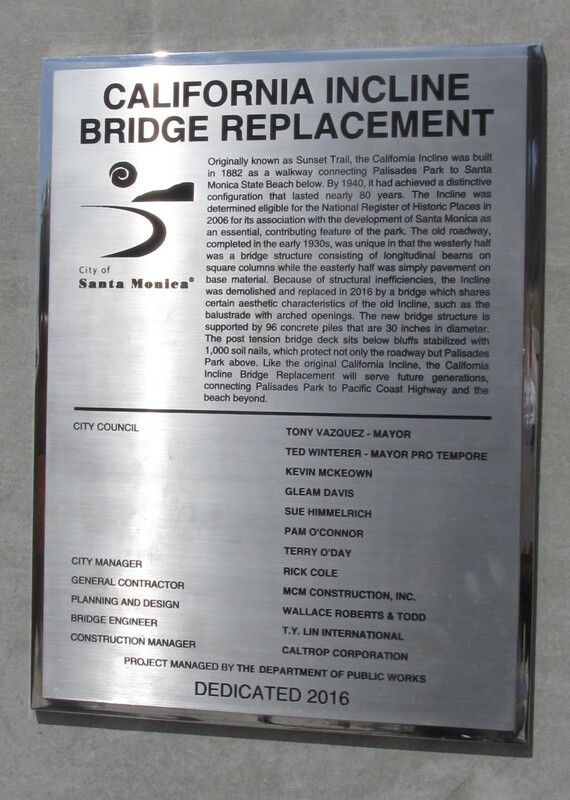 And at the other end of the path, we rode the new bridge over the river to Figueroa Street, and I stopped to take a picture of the stub of the old bridge. 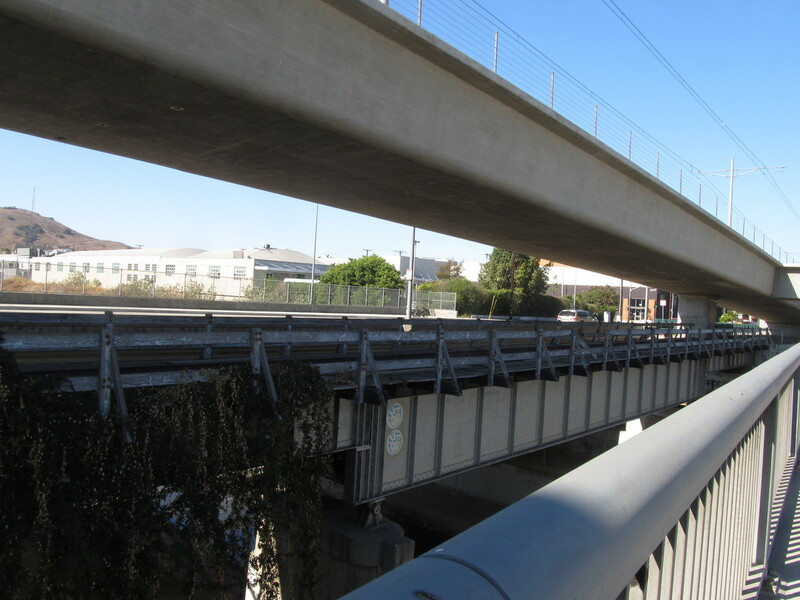 Then we rode up to Ave 43 and got on the Arroyo Seco bike path to South Pasadena. All in all, it was a pleasant ride.